A new kind of bass distortion that offers some of the best sounds around, with top-notch build and reliability. Guitarists should try it, too! The distortion sounds. Signal blend facility. A pedal of this size needs securing on a pedalboard for stage use. It's often suggested that the best way to get a worthwhile effected bass sound is by mixing in a clean signal so that the full impact of your sound is not diluted. 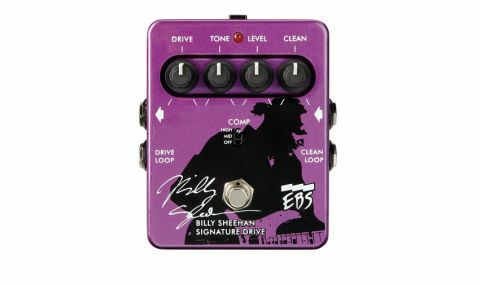 Billy Sheehan has been doing this for years: using separate feeds from his bass into a purpose-built mixer to combine the signals. Now, however, this Signature Drive will do it using a single box. "You can introduce distortion to your clean sound to the exact level you desire without losing sonic impact"
It's an overdrive/distortion with plenty of adjustability, but it's the added ability to blend in the clean signal that makes it special. The pedal also has three different compression modes to keep the notes well defined. There are extra jack sockets, too, allowing other effects to be added to the loop and controlled for the ultimate in balanced sound blending. With individual level controls you can introduce distortion to your clean sound to the exact level you desire without losing sonic impact. The tone and level knobs provide plenty of variation without getting too crazy, introducing warmth, growl, drive, even enhancing harmonics. Introducing more effects into the chain is a simple and effective process.